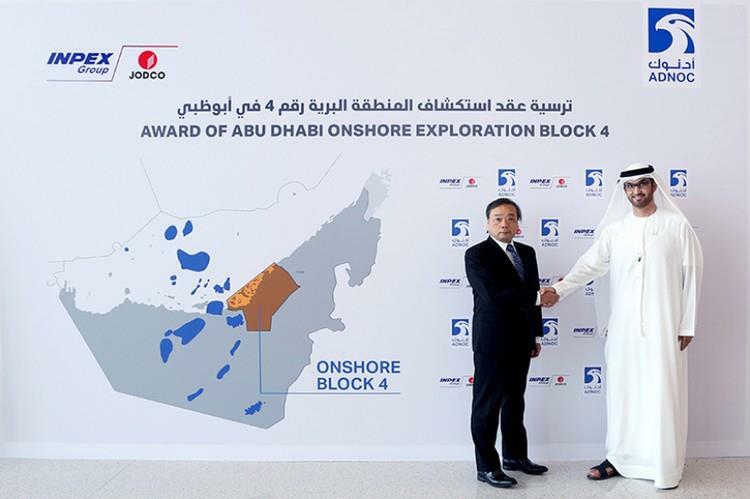 The Abu Dhabi National Oil Company (ADNOC) has signed an agreement awarding the exploration rights for Abu Dhabi Onshore Block 4 to Japan’s INPEX Corp. A wholly-owned INPEX subsidiary, JODCO Exploration, will hold and manage the interest in the concession on behalf of INPEX. The award has been endorsed by Abu Dhabi’s Supreme Petroleum Council (SPC) and represents the deep commercial and economic relationship as well as long-standing energy partnership between the UAE and Japan. INPEX will hold a 100 per cent stake in the exploration phase, investing up to AED 646 million (US $176 million), including a participation fee, to explore for and appraise oil and gas opportunities in the block that covers an onshore area of 6,116 km2 from Abu Dhabi city to the boundary with the Emirate of Dubai. H.E. Dr. Al Jaber said: 'This award to INPEX is a further demonstration of how ADNOC is utilizing value-adding partnerships and new technologies to accelerate the exploration and development of Abu Dhabi’s substantial untapped hydrocarbon resources. It is an important part of our 2030 smart growth strategy, helping to ensure we stay ahead of the long-term increase in demand for energy and oil and gas products, further strengthening Abu Dhabi’s position as an essential energy provider to the world. Takayuki Ueda, President and CEO of INPEX CORPORATION, said: 'INPEX positions Abu Dhabi as one of its core business areas, and we look forward to working in close cooperation with ADNOC to help it unlock value from Abu Dhabi’s substantial hydrocarbon resources while further expanding and strengthening our own business portfolio. 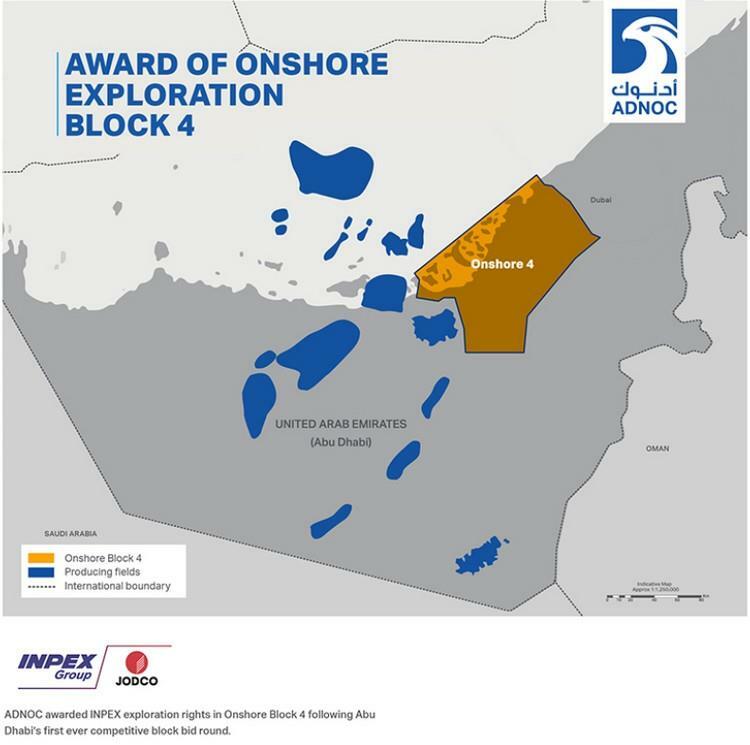 Following the recent award of Offshore Block 1, Offshore Block 2 and Onshore Block 3 Concessions, Onshore Block 4 is the latest block awarded to an international bidder of the geographical areas that were offered for commercial bidding by ADNOC in April 2018. Studies suggest Abu Dhabi’s exploration blocks hold multiple billion barrels of oil and multiple trillion cubic feet of natural gas.